The Milford track is one of the most beautiful hikes in the world and now we have done it we can see why! The Milford track is nearly 54km and you spend 3 nights and 4 days on the track in the remote and beautiful Fiordland National Park. The trip starts with a beautiful boat ride across Lake Te Anau and finishes with another boat ride in the beautiful Milford sounds. You walk through untouched New Zealand native bush, swim in the cold but clear rivers and waterfalls and enjoy snow caped mountains! Every moment of the hike is beautiful if you can ignore the pain in your feet. Fiordland is the wettest place in New Zealand but don’t let that put you off, the mist and the extra waterfalls as a result of the rain makes walking the Milford Track a truly magical experience. Empty water bottle – You can drink from the streams. Too many clothes – Limit what you carry so you don’t suffer. 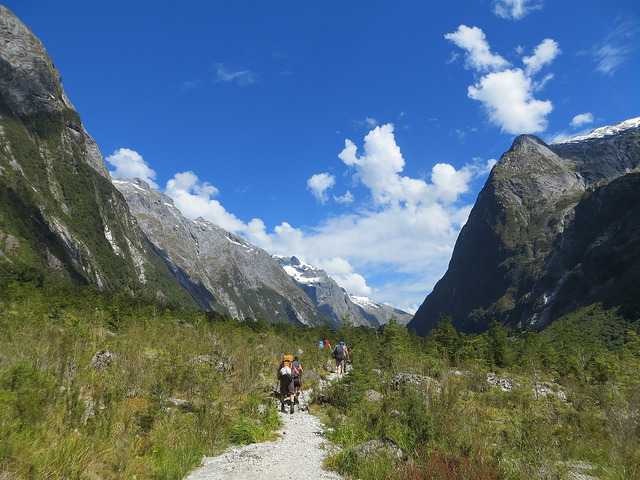 You finish the hike in the wonderful Milford Sounds! Make sure you book early to secure your spot on this magnificent hike. It really is a must do if you visit New Zealand. Please respect this beautiful environment and take all your rubbish with you. We made it to the boat!